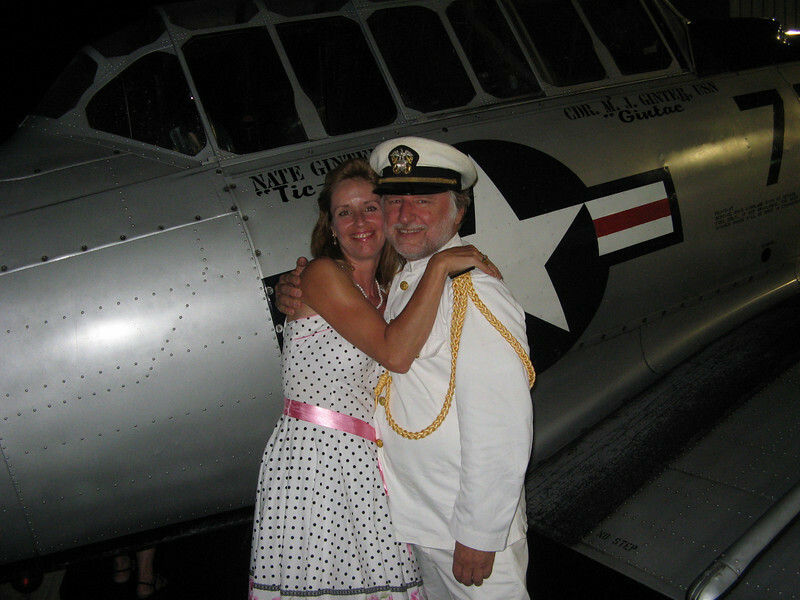 Attended the National Capital Squadron's Annual Hanger Dance in Leesburg VA, Saturday Aug 29, 2009. Always a great dance and time to chat with friends and make new ones. A reenactor friend, Andrea Wilson and her son Cameron came with us.We didn't dance too much as Sharon was recuperating from some minor foot surgery and need to stay off her feet. We did manage a few foxtrots and swing dances. They have a best "vintage dressed" contest. Col Bob and Julia came in first (it is his original uniform along with all the ribbons and pins) and Sharon and I were runner up. They also had a silent auction for the ride in the SNJ (the silver plane in the picture) which my bid was the highest - my birthday present from Sharon. Being an officer and a gentleman. A Navy uniform always does it! Its tough duty. Her boyfriend made me do it, honest.